Steel City Sound received the sad news this week that Davd Rossall from Rev. Black and the Rockin' Vicars had passed away from lung cancer on 4 January, 2012. He was 65. Peter Sheehan informs SCS that Dave smoked two packets a day even in the Vicars days, whilst former Rev. Black keyboardist Neil Williamson says he smoked right up until his death. Perhaps it may be relevant that David's 90-year-old mother, Alice, passed away only a few weeks ago, on the 12th December, 2010. David arrived in Wollongong from the UK on a mission. Possessed of great ambitions and an irrepressible personality, he had a great singing voice and had been a very young guitarist in the Blackpool band Bruce And The Spiders, before George Rossall migrated with his family to Australia. David no doubt took many of his influences from his father, who had great plans for the talented David. Both of them were masters of the art of spin. In 1967, an Illawarra Mercury headline announced "FROM ENGLAND--Rev Black & The Rockin Vickers" together with a large picture of David and four of Wollongong's most well-known musicians. The article went on to describe how David had brought this band from England to Australia after failing to have chart success over there. Furthermore, he had written a great song called 'Tears & Kisses' which they were going to record, and he was sure it was going to be a big hit. There had been a recording band in Northern England called Reverend Black & The Rocking Vicars, but David was never a member. 'Tears & Kisses', as it happens, was originally written by an American named Stanley J Gelber and recorded by two previous acts before Rossall laid claim to it's creation. Nevertheless, the group was seen by Festival Records as a potential success, and four singles followed, albeit with limited success. Meanwhile, George and David continued to supply fanciful stories to the press about The Vicars, including that they had been signed up for a big American tour. Williamson told me the first he knew of the tour was when he strolled down to the newsagent and saw the headline on the front page of The Mercury. After The Vicars failed to achiev success David persisted by turning the band into a four-part harmony act called Tin Pan Alley, under which name they recorded a professional single for Columbia records in 1969. Chart success still eluded them, and David appears, after all his efforts, to have become somewhat embittered and disillusioned. He had the talent, but somehow he had never quite made it, while lesser talents had been better promoted. 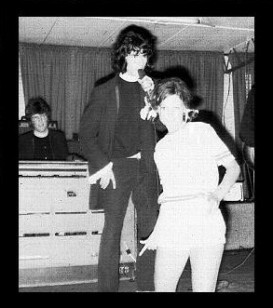 On stage, he was a most dynamic performer, presenting a fantastic stage show, and he had many, many female admirers. He was well known for being followed around by his faithful German shepherd dog, Lady, and he was distraught when she died. In later years, when approached by old muso friends or journalists wishing to discuss the hectic years of the Rockin' Vicars, David was reported to have snapped on occasions, making it quite clear that he never wanted to talk about those days again. This is unfortunate, because there were many questions left unanswered concerning the life of this uniquely talented man. Rossall is survived by his wife Eunice, children Heath and Sara and grandchildren Jhidyn and Sam. Go here for more information on Rev. Black and the Rockin' Vicars, including audio downloads. r.i.p. dave--had a ball going to dances where u played. One of the best bands of the 60s. 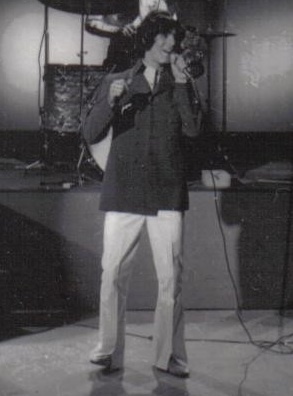 He also sang with Tin Pan Alley who competed in the 1969 Hoadley’s Battle of the Sounds... going through three heats at Wollongong, Canberra & then the Capitol Theatre, Sydney and then going on to represent Country NSW as one of the twelve finalists in the National finals held in Melbourne. This was the third year in a row that a Wollongong band went through to the chosen eight bands in the Grand finals. This was the year too, they competed in Martin Erdmans "Sounds of '69" band recording contest, and were one of the winning 26 bands in this contest, who played live before an 8000 strong crowd in July 1969 at the Sydney Showground where they wowed the crowd with a great version of the song "Hair". Hello Kimbo, My name is Stuart Bedford, I played guitar and vocals with The Vicars and the Original Tin Pan Alley. I would just like to thank you for your comments on the Band, Dave who I thought the world of and your appreciation of the version of Hair. I have a recording of Tin Pan Alley doing a Coka Cola Ad in 1969 with Pat Aulton who recoded "The Lion Sleeps Tonight. If you would like to hear it just email me at "stuartbedford@hotmail.com.au and I will send it to you, regards Stuart.